With so many choices of species to target during the winter months and with so many new techniques, tackle, gadgets, etc.. to use, the options can seem endless at times. So, what species do you target during the winter, and do you target a different species during a different time? I'm a big panfisherman, so crappies and gills are my favorite. But catfish and smallies are at the top of my list as well. 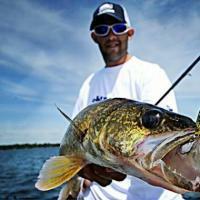 Jigging for pike can be a lot of fun and the action can be pretty good at times. And than you have the midnight eelpout run, always fun I'm sure for those who target lakers its tough to beat the raw power of those tough fighting fish. Ah Matt - you are getting the ice bug as badly as I am, I can TELL!! LOL! I've been primarily a perch and gill fisherman, but my interest in crappies and walleyes has been growing big time! To the point I plan to target those two species as my primary fish this year. Likely it will be eyes at first/early ice, then moving over to the panfish. It's so darn hard to pick a favorite! Late ice Pike on tip-ups at Lake of the Woods. Can be awefully quiet at times but for some reason, I'm already looking forward to it again. Other than that, crappies & walleyes, whatever is biting better. Can't wait until you guys get me on top of some of these this winter! Targeting large sunnies and crappies during the hard water season, is what I really like to do. It is and active type of fishing and hopping from one spot to the next suits my style. I like fishing out in the open whenever I can. I don't think anything of cutting 25 holes, plus fishing any I find open and unused. When the bite is slow, I bet I walk a good 5 miles between holes...panfishing keeps me in shape in the winter. Next would be sitting in a house, with your partner, over a good Crappie bite (Red Lake is the optimum) I love seeing that bobber go down. Next is pike on tip ups, one down while you are hunting the panfish. I fish walleyes to, but even with jigging and a dead stick, it can get pretty slow sometimes. Round these parts we mostly go for perch and tip ups out for northerns. Mostly I target a 12-pack of Pabst Blue Ribbon, a pound of bacon, and a bag of chips in the fish house. I seem to have better luck finding the beer than I do finding the fish. I've seen some of your pike that you posted in the past, some nice fish! Big pike are fun thats for sure and late ice up on LOW can be some of the best for those bigguns. I know fiskyknut fishes for those quite often and he's always e-mailing me pictures of upper 30s, lower 40s inch pike. Last winter was a disappointment for me, we only had a couple flags and managed to lose both fish on the way to the hole. Both would have been near the 40 mark. I might start after Pike a little earlier this year. By the time I got up there last year, the ice was getting pretty bad. Funny thing about Fisky, I ran into him out on the ice a couple years ago and didn't know who he was. Later I saw his picture on here and I was like, "I've seen him before." He knows his stuff. Couple years ago, I'd never used a tip-up and he got me pointed in the right direction through FM here and, well, I've seen some results. Now where is that 42-43 incher hiding at?? I've had the honor of meeting Fisky once as well. A very nice guy and he sure does know his stuff about LOW. I'm going to make it a point to head up that way and ice fish with him this winter. Maybe we can all plan a date and chase some big pike. Where on LOW are you guys catchin' them little northerns? Maybe I'll join ya. Towards Buffalo Bay as well as Zippel Bay I believe. Its mostly a late ice bite. Metro crappies after winter weights, early ice eyes, and eyes in MJ's an my stomping grounds. Think hard matt, its closer then you think, our qb and i stumbled on them last winter trying his new auger out. Wallys' and Crapps during the winter and spring months except I have to split June, then Carp with the .357 (hollow points) and a good backstop. Good thing the people on THAT lake are EARLY risers. But,THEY ARE Crabby, You can hear 'em bi%#@in' across the lake! I'd HATE to be the one that wakes 'em! Funny how CONCUSSION can make you a REALLY GOOD SHOT! Those Carp quivver a LONG time! I would say late ice for trophy pike up on LOW. Buffalo Bay and Zippel Bay are two good areas to target. Deadbait is good, but lively minnows work good too. I prefer to jig/pause those monsters on jigging rods. I would say late ice too. End of March into April. Once the ice goes out, they start getting into them again as they are getting ready to spawn. Warroad River & Zippel Bay are two good choices once the ice is out. Pay attention to the Lake of the Woods forum come later winter. Some specific areas are better than others but those spots are starting to draw a crowd. The action can be VERY, VERY slow at times but in my opinion, it only takes 1 fish to make the trip a trip of a liftetime. When it comes to these big fish, I can't emphasize enough how important it is to release them. Lake of the Woods has a 30-40" protected slot limit which is a good part of the reason why the fish are so big. I would love to see that 40" number slide up to 42" but I doubt it will happen. Have to be big pig walleyes and jumbo perch. Aint nothing like sticking and moving around a good area and then all of a sudden: JACKPOT! gotta love it! Watching pike on the underwater camera is the best. Too bad you couldn't make it for the Lake Bemidji Eelpout run, they were on fire for awhile! What a great time!!! As for LOTW pike, we have a cabin on Zippel Bay, and we hit some nicer pike nearly evey time out. They would blip through mid range on the Vexilar, you'd bring up the spoon and voila! I got a 36" on a tip up under a Stone Legacy Freeze-Bee and a 41.25" on a Phelp's Glow Spoon, both within a months time. Onto my favorites, I'd definitely have to say... lakers!!! I thought for sure you'd say bull gills Didn't you qualify for a Master Anglers Award for the 41.25 inch pike? 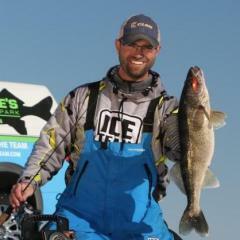 My favorite are the big walleyes. Although I'm far from picky! Probably a close second is pike on tip ups and slab crappies! Fun fun fun!! Oh and big blue gills can be a riot if you can find them!